Bless you for putting this together. This is a popular request and now I have a place to point people. What would be great is if you opened up this framework so that other chart aficionados (I’m thinking of Kelly O’Day at processtrends.com) would have a chance to add new chart types. Thank you Zach for the suggestion. I like your idea; let me think about how we could implement this. Thanks also for drawing my attention to the work of Kelly O’Day; I am posting on this today. 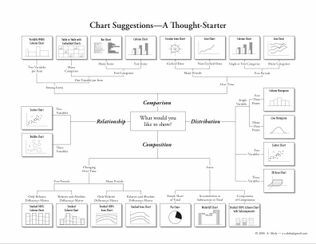 There is another very interesting way of helping to find the right chart. Great article, i have linked you on my blog. Bless you. Deciding on which chart type to use in our reports has always been a bit of pain … no more … you saved the day. Thanks to you we’re already using the pdf as a reference when choosing an appropriate chart for each specific report. Great job! Thanks! You’re welcome Alex. Now check out http://www.Chartchooser.com and tell me what you think. This is really great Andrew! and ,if you mail me the soure file , I will translate it into chinese ,and introduce to chinese readers. fantastic! Thanks for this – so handy to have when you are a bit stuck for inspiration! Thanks a million for this great resource. I´ll distribute it to the rest of my colleagues. Excellent infoviz tips. Thanks for the PDF! You are all very welcome. Glad you are finding it useful. I’d be glad to make a portuguese version (pt-BR) if I have the source file. Thanks for this chooser especially for PDF! I would like to create russian version. Is it possible to get source file? Thanks! Great Diagram! So important to pick the right graph for the data you are showing. This has been very a very popular tweet from http://www.pureshare.com. If you send me the source file then I make the Hungarian version. Is it ok if I hand this out in my Excel class next week? I’m going to be starting on charts and this would be oh so helpful. I do plan on giving you credit and pointing people to your site. Very nice and very helpful, Just want to say Keep it up. Good work drew Its a really good diagram. For comparing two distributions, or one distribution to a theoretical distribution, what you want is a QQPlot, which looks somewhat like a scatter chart but is an entirely different thing. For comparing many distributions, you want boxplots. You probably would want candlesticks for a low-periodicity look at time-series (like showing daily data by month). Finally, to compare two really large sets of data you could consider something like the flower charts Stata does, but this would require some explanation. I do appreciate what you’re doing here, though – you’re encouraging people to be bold with their data presentation practices. This table is very useful for me. Thanks for sharing this. Great article! Great resource. I will share it to my classmates. and this post would be very helpful indeed. The various types of charts can sometimes be confusing but thanks to you, I now have a guide as to which works best with my report.